I am female and short. I can handle a heavier mower as long as it is self-propelled. Needs to be able to mulch, because I mulch a lot of leaves in the fall and I also hate spewing grass out the side of the mower as I mow (don't have time to rake it up). I have a large backyard (total yard approx. 2/3+ acre) that my smaller mower can't handle, esp. since my job demands mean I sometimes can't mow for a couple of weeks and the grass gets long. I don't mind spending the money on a good mower, so long as it is reliable and actually starts! Not interested in a key start model, as my experience with a key start mower was not good, and the battery adds a lot of weight. Not interested in a riding mower, because of the space it takes up and maintenance required. More importantly, I get good exercise walking behind the self-propelled. Any suggestions? I have heard good things about Cub Cadets, but don't know anyone who has one. Many thanks to anyone who wades through my novel and has a suggestion. Most mowers will mulch. You have to change the blades to a mulching blade. I've got a Husqvarna all wheel drive with a Honda engine. It'll start first or second pull for me every time. My son, who is stronger and faster with longer arms can get it to start first pull every time. But that's a big deal becasue I can not pull start many small engines; I'm just not strong enough. As it is, if the engine is cold, I must have it on a level solid surface. If it is warmed up, I can start it while out on the lawn. My lawn mower does not have a mulching blade, but it has a chute where the grass can be thrown out without using the collecting bag. That has worked just fine for me. If I let the grass get too long, I will tun back over the cut grass to chop it some more. The lot that I mow has a pronounced slant to it and the self propelled all wheel drive handles hills with ease. I would not be capable of pulling a heavy mower up and down that hill if it didn't pull itself. The engine on that mower does happen to be the large size Honda. They make different size lawnmower engines. I had to learn how to regulate the speed because the machine can be too fast for me and it will drag me along if I give it too much gas. It has handled some pretty tall grass without choking. It's a powerful machine, but it is also quite heavy. I have a Honda Model # HRR216K9VKA that doesn't give me a lick of trouble. I also have a four stroke Lawnboy that sits outside all year for the past ten years, and still starts on the first or second pull. Thanks to both of you for those suggestions. I will do some research. I was dismayed to find out today that Home Depot sells Cub Cadets. A lot of Toro reviews I have read trace the fall in quality of their mowers to the time when they started selling to the Depot. I guess pricing pressures + need to produce in even more mass quantity resulted in lower quality. I did note that that Honda linked to above is sold by Home Depot, so hopefully Honda has been able to maintain quality while increasing quantity. I have a Honda self propelled from HD as well. It's been 6 yrs and it still starts on the first pull every time. I only wish my POS weed whacker do the same. Not sure the model number & too lazy to get off my couch to find out. But you can't go wrong with a Honda. Previously I had a hand-me-down craftsman push mower. I still remember the day I replaced it with the Honda it was like mowing yard has never been so easy! The toughest part sometimes is I need to WALK faster do I can keep up with the mower! Get one. You'd be happy you did. I have a 1986 Honda HR214 SXA that I bought brand new. I've had to replace the wheels as I wore them out on grass. I've replaced the spark plug once, carb once, and the air filter I have replaced only once as I keep a cleanable insert around it. I change the oil every spring and will sharpen the blade several times a year with a hand file. The blade brake on it is getting weak so cutting tall grass is out for it. It doesn't have the HP of the new ones anyway. The engine is getting tired so I decided last year to buy a new one. To get the same mower, I would have to move up to the commercial Master series so I bought one, over 1200 bucks. Brought it home, cut the back yard and took it back. By comparison to the 1986 model I have, their most expensive mower is junk. The lesser models are even worse. They have tons of issues with the Roto-stop blade which is suppose to function like my Blade Brake but in order to keep it working right, you need to replace the plastic sleeves on the locking studs EVERY YEAR. The parts are only 2 bucks but the labor will usually be a hundred. They have issues with the new ones and ethanol gas. Use it and the gaskets swell up and hard starting is in your future. You can buy either isobutanol gas or Tru-Fuel at the rate of 20 bucks a gallon. The variable transmissions of the new ones are also an issue. They just won't hold up whereas my old 2 speed is doing fine. Some of the newer models have a belt drive for the rear wheels. Expect to replace it every 2 years. Mine uses a driveshaft. Honda at one time made the absolute best engines you could buy at any price. Those days are gone. For a reliable mower like the old Hondas, you need to look to the commercial Ariens mowers. Most will have the commercial grade Kawasaki engines and they are just about as good as any Honda that has ever been made. The downside- price. You won't buy one for 400 bucks. You'll probably be a lot closer to 800 bucks out the door. But you won't be buying another one for a long, long time. When I bought my Honda in 1986, I thought I had slipped a brain cell or two paying over 400 for a Honda lawn mower when I could have bought a self propelled Craftsman for just over a 100 bucks. It's obviously been a great investment for me. But you need to consider what is important to you about the machine. The rear wheel drive is priceless as is the blade brake for me. Most are generally easy starting. You might even consider an electric start mower but look into the cost of a battery first. I won't buy a mower that weighs over 80lbs, not even by as much as 1 pound. They get heavy to turn after a while. They can be real clumsy over 80lbs. Next year I have a decision to make. Either rebuild the current Honda from top to bottom which is not a cheap date or buy a new mower. Right now after looking at what is out there, the Honda will probably get rebuilt this winter. Might also check on Craigslist for a Honda HR214. I found one 2 years ago for our church that was in storage most of its life. Paid 100 bucks for it and it was near new. Looking back I wish I had kept it but the church needed a good mower and it has been just as good as mine so far. I think I'll check on Craigslist myself. Best of luck. My 23 year old 5HP self propelled MTD mower now has rust holes though the deck, still starts on first pull doesn't smoke and is incredibly quiet and mows like there is no tomorrow. I am really going to miss it. I am looking at Cub Cadet SC 500 hw RWD Self Propelled, the Craftsman RWD 7.25 and the Honda. Leaning towards the Cub Cadet SC 500 hw from a local dealer if I don't I might just buy a rider. Thanks to all who have responded. Greatly appreciated. Reps to you all. What is MTD? A lawnmower that lasted 23 years -- wow!! A Honda that lasted 30 years -- double wow!! MTD makes various brands of mowers including the Craftsman Series from Sears. They also make Cub Cadet, Yard man, Yard Machine, and Bolens. 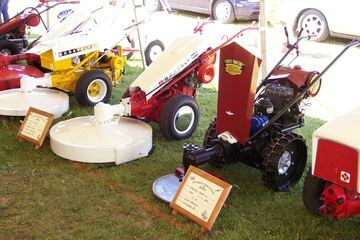 Bolens would be their idea of a commercial mower. LOTS of stamped parts in their equipment. They do not make their own engines and most will have a Briggs and Stratton engine. The B&G engines at one time were the best out there. Then the bean counters struck. I wouldn't have a B&G engine on anything including their Industrial Series. Far too many plastic parts that break like the plastic intake manifolds on most of them. Ariens makes commercial equipment. They bought out Gravely years back. Talk about a grass and weed eating machine, run a Gravely Model L around some 5 ft tall weeds and be impressed. But they don't make the Model L anymore. It was owned by Studebaker, the car maker. Most of the mowers from the 1940's are still running strong. My dads 1961 Model L still starts first pull but it's not for a normal residential yard. It's far too heavy duty unless you are cutting acreage and need something more than just a mower. Check out the Ariens line. One will last longer than you'll probably want it. FWIW, our church has a Yard Machine 42" 10HP riding mower gifted to it. It's been nothing but a headache with non stop break downs. It's a real flimsy design. The Briggs engine isn't much better. We cut just over 4 acres with it and when it's down, the Honda does it, all 21" at a time. The Honda HR214 is hard to beat. The new ones, not so much.